Online sites will often compress photos for web quality, or to a lower resolution that will appear perfectly fine on a computer or mobile device screen. Images that are going to be physically printed require a much larger file size, and higher quality, in order to appear crisp. Our photo uploader will automatically let you know if your online photo file is too small for us to print. 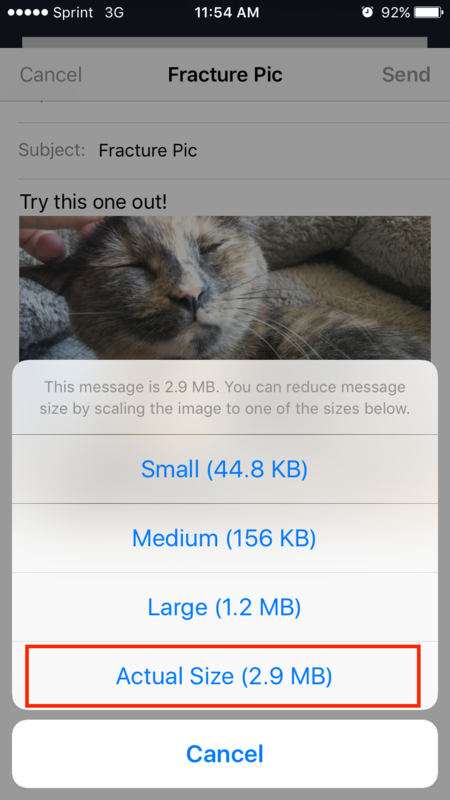 Instagram - All photos uploaded through Instagram are in a 1:1 aspect ratio and a 640 x 640 pixel dimension. This means these type of photo uploads can only print in our Small Square size. If you would like to print in a Medium Rectangle size and up, a larger version of the photo must be uploaded (preferably the original photo file from your phone). Facebook - Photos uploaded to Facebook will be stored at a maximum of 2048 pixels on the largest edge. Images uploaded from this source can usually only be printed at the Small Square or Rectangle, Medium Rectangle, and sometimes Classic size. Email - While images taken from an email attachment are often a better option than Instagram or Facebook uploads, your photos are still prone to being compressed when sending/receiving them in an email attachment. The size Fracture that you can order, image dimensions, and resolution will vary greatly depending on how your image was sent. To find out the exact dimensions and resolution of your images click here. For more info, check out our blog post on The Single Best Way to Get the Greatest Prints of Your Photos. This post will help you turn your Fracture from a bleak and blurry zero to a clear and crisp hero.